Blurb on technology, from a Vigilant.IT perspective. 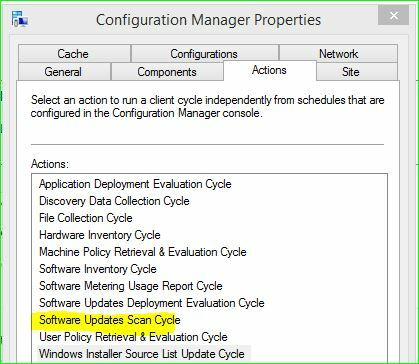 Just recently, I’ve been wondering why I haven’t been prompted with any new Windows Updates from SCCM. I haven’t had too much time to look into this, but thought today is the day to get this sorted. My colleagues on the other hand were ecstatic that they were receiving these updates. 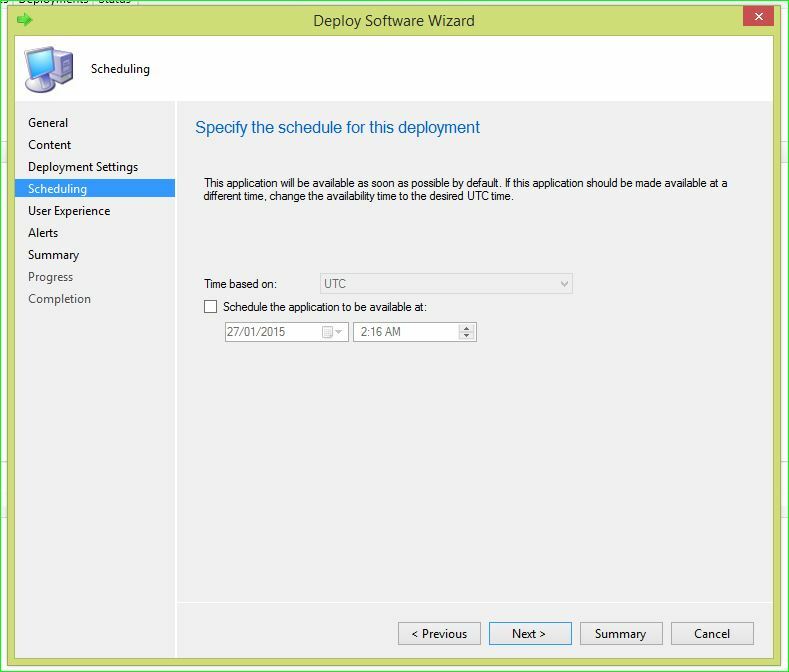 The ADR policy set for Windows 8.1 updates (critical and security updates ONLY) is to deploy 2 days after it’s release and wait a further 7 days until it is forced installed. 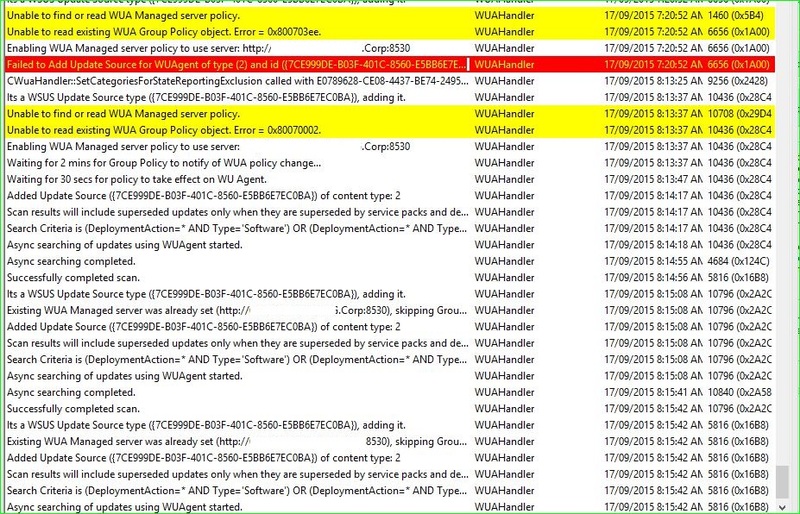 We too have another ADR policy for Office 2013 updates. 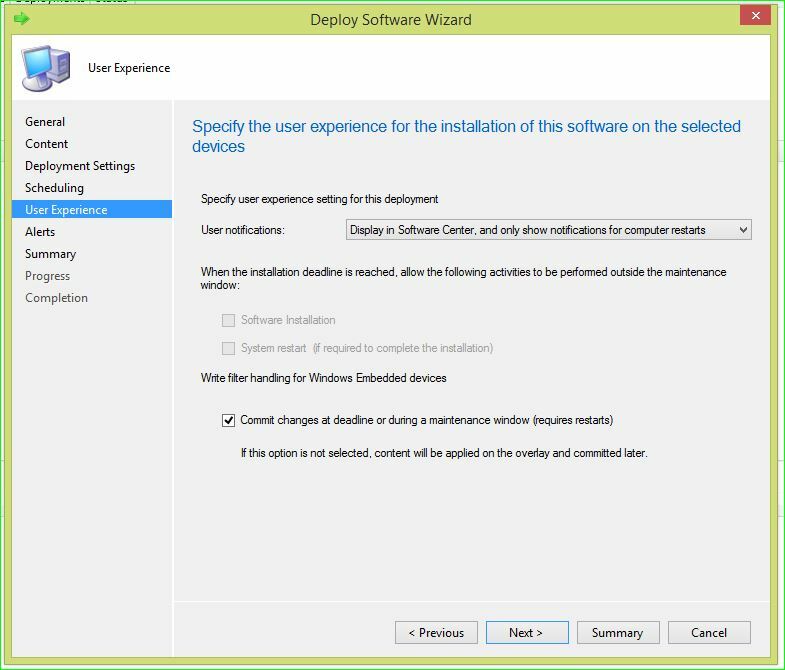 Same rule applies, 2 days deploy, 7 days install. Having being well over that 7-9 day period, the boys are constantly prompted about a reboot (note – some of my colleagues reboot their PCs on an annually occurrence…….). This log file will more or less advise what the problem or at least, guide you in the right direction in terms of identifying update issues. After reviewing Matthew Hudson’s blog, even though the error message is different, the process that he advised worked for me. You should see the Registry.pol file. Once you’ve renamed said file, ensure you have the WUAHandler.log open. 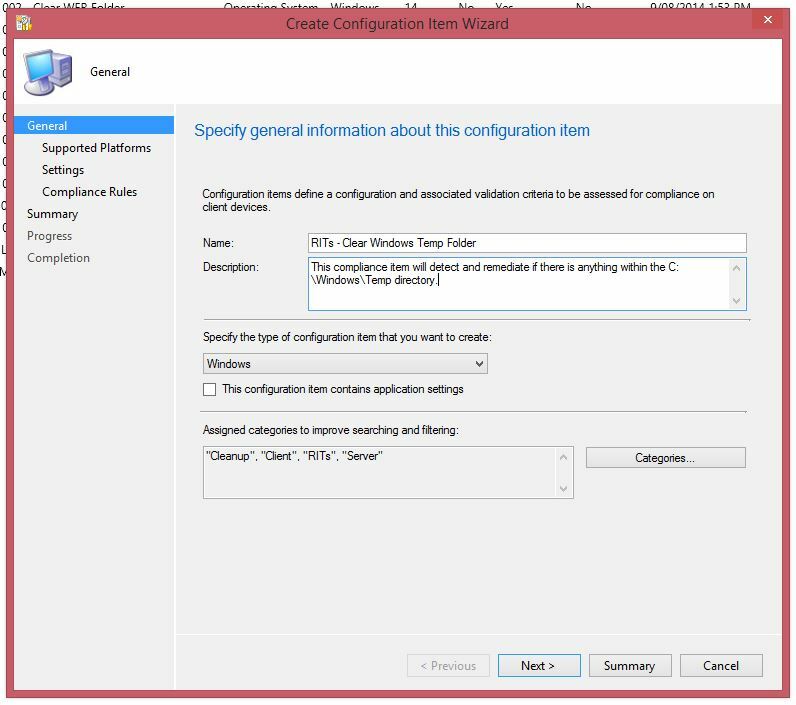 Open up the Services (services.msc) window on the client PC and restart the SMSAgent service. Once reset, you should see the WUAHandler.log file populate. 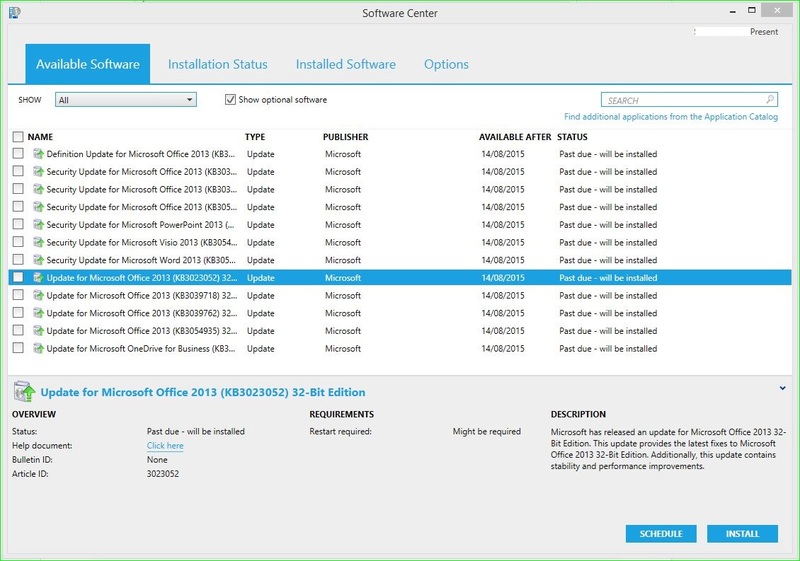 Software Center should now display all missing updates. Hope this helps someone out there! I’m back; it has been too long! 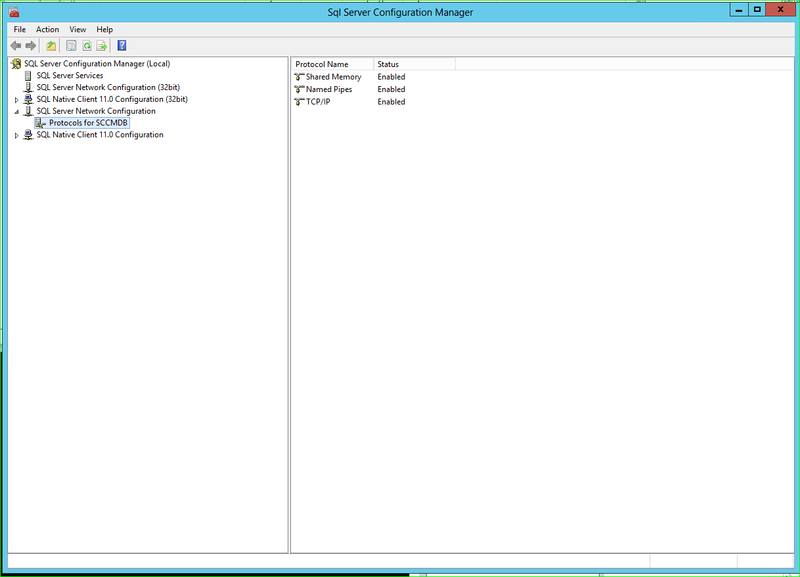 So I was stuck attempting to open the SQL Server Configuration Manager Application on my Configuration Manager Server. This problem would have arose when we uninstalled an instance of SQL server; the WMI provider would have been removed during this process. From what I’ve researched, both the 32bit and 64bit instance of SQL Server share the same WMI configuration file. 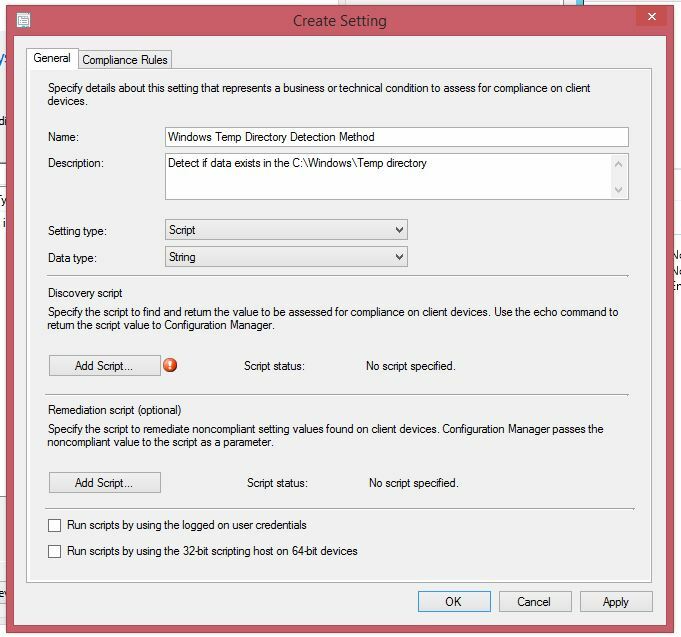 Open a CMD prompt as an Administrator. Now browse to the following location, which would be the version of SQL you’re using on your SCCM server (or where the DB resides for your SCCM environment). 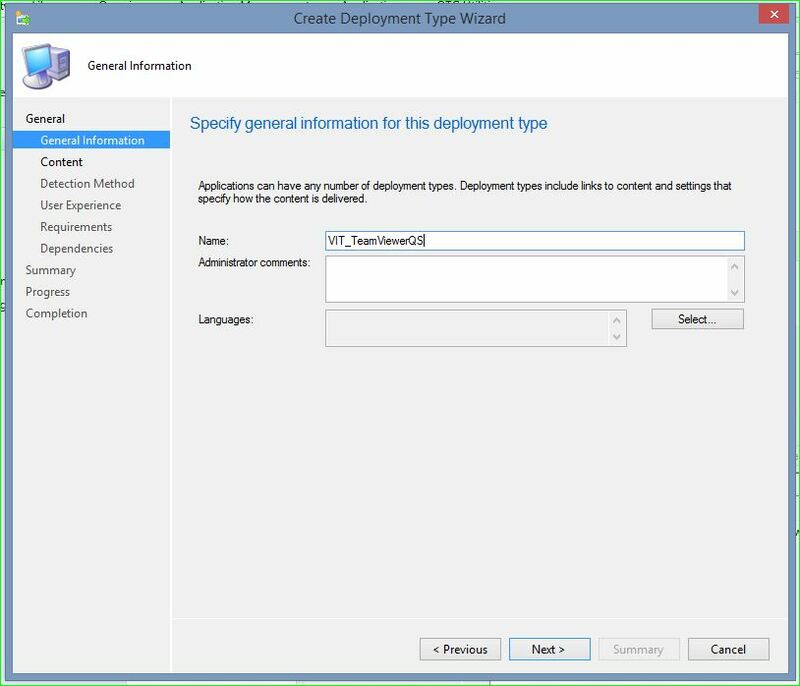 We’re now able to re-open the SQL Server Configuration Manager Window! 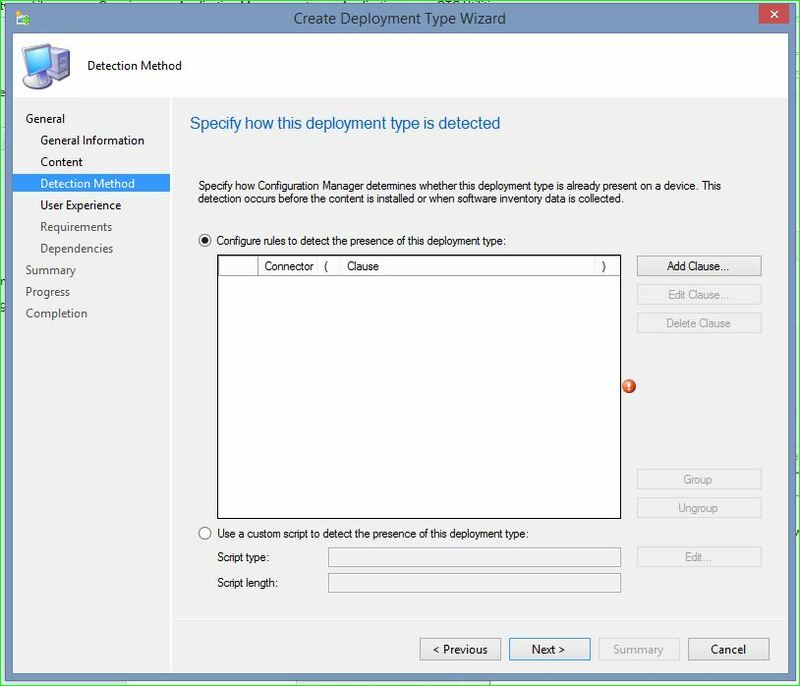 SCCM Application Deployment Error – 0x87D00607 Fix! Down the other end of the office I could hear one of my colleagues complaining that an App deployment failed when installing from their SCCM’s Software Center Console on their workstation. Generally, the first place to check is with your boundaries and boundary groups and to ensure that they’re setup correctly. Actually, reviewing your boundaries and boundary groups should be the first place to check when troubleshooting these errors. The way we’ve configured the boundary groups within our environment(s) is through the use of Active Directory. Some choose to use IP subnets to define their boundaries, however we found that Active Directory would best suit our environment/setup. 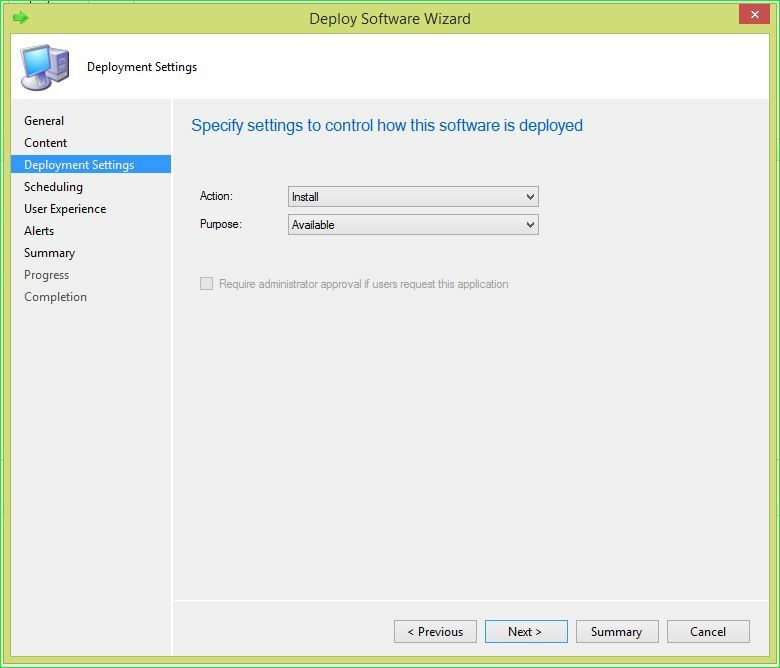 Resolution; Change the Deployment option under the Application deployment section. I had ‘Do not download content’ selected from the dropdown menu. 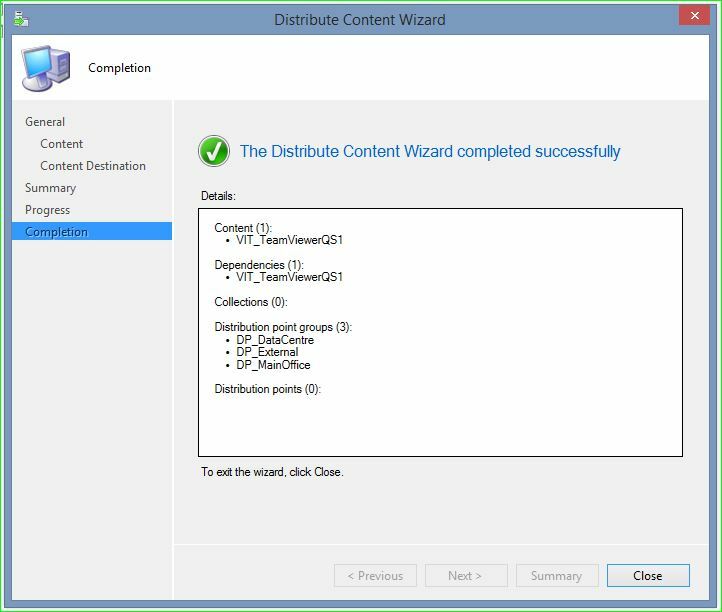 As soon as I changed it to ‘Download content from distribution point and run locally‘, I was able to install the application successfully. We now have a quieter office thanks to this resolution! Good Luck! 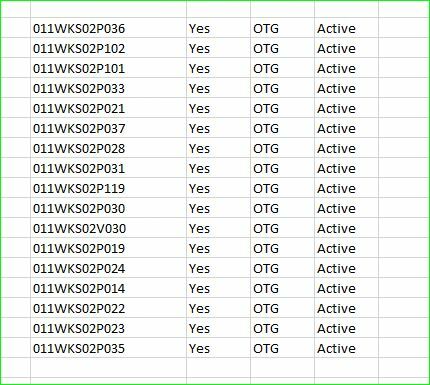 So there have been several requests internally who are NOW starting to leverage off the information that is readily available within SCCM. 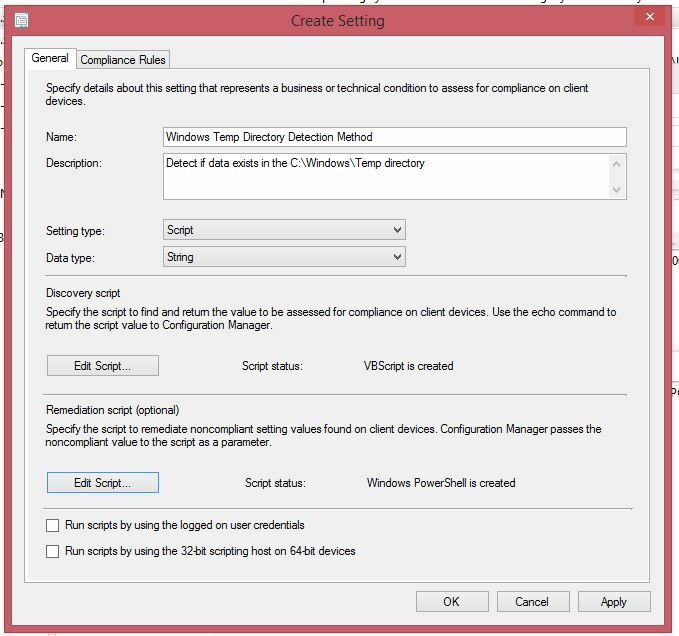 Question; How do I export a list of devices from SCCM into Excel? Solution; Easy! Ctrl A, Ctrl C, (select Excel spreadsheet), Ctrl V. Done. 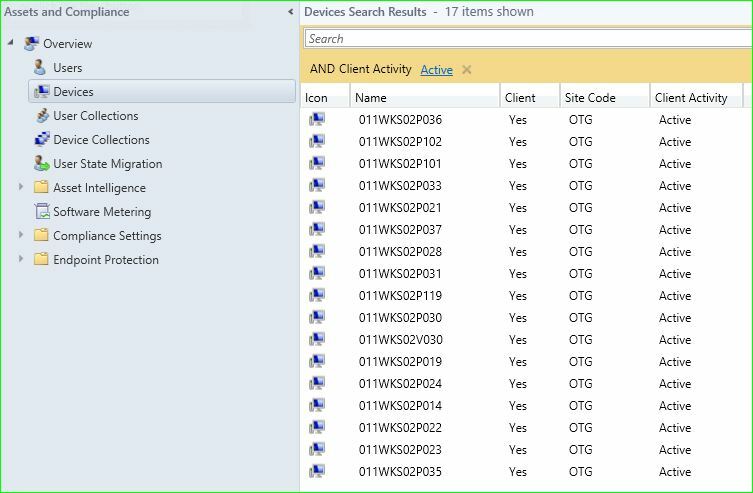 As I need the list of Active PCs on the network, I have used the search functionality within devices. 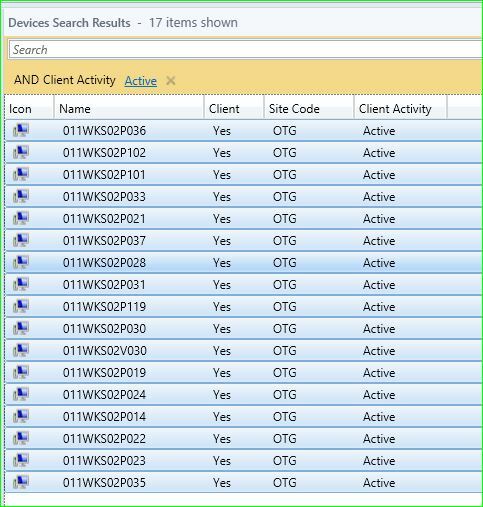 Note; this is just an example, as you can easily achieve this by using the Active/Inactive Collection under Device Collections. Literally, use the Select All key combination (Ctrl + A) or Individual selection key combination (Ctrl + Left Mouse Click) and Copy the data (Ctrl + C). As you can see, you should now have your ‘export’ performed successfully. See the comparison below; requirement achieved. 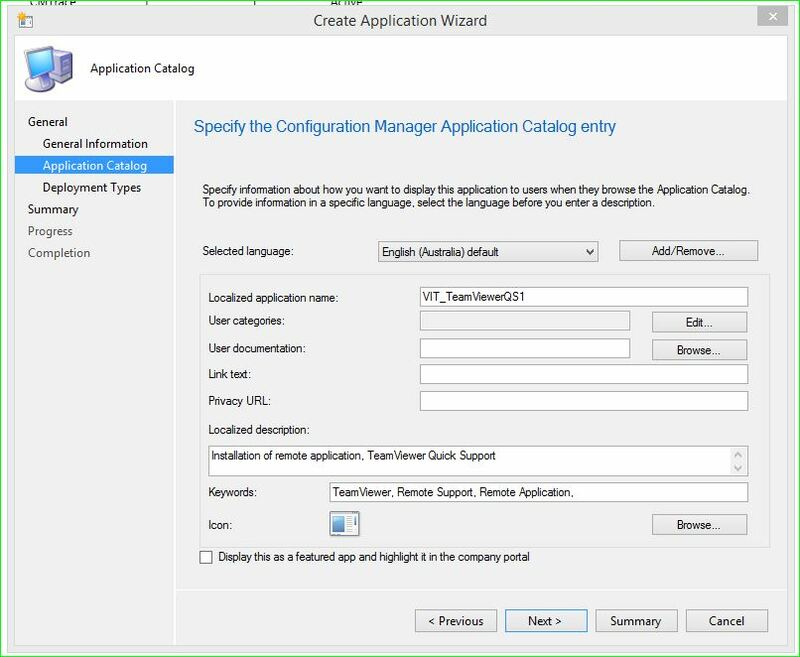 Remote Access Support Tool available through SCCM’s Software Center! Have there been times where a 3rd party service provider requires remote access to an Application Server (or any server) to work on an upgrade or to diagnose an issue? Because we’re all security conscious System Admins (right? ), we DO NOT want to install any ‘remote application’ that could potentially expose/compromise the environment, let alone that server. 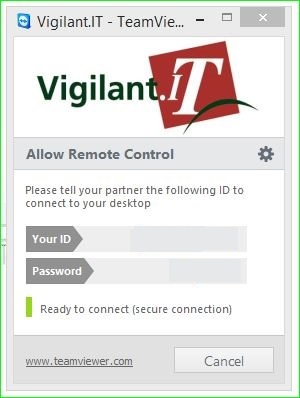 To reduce the surface attack space on our servers, we (Vigilant.IT) have verified remote applications that we have published to our Software Center. 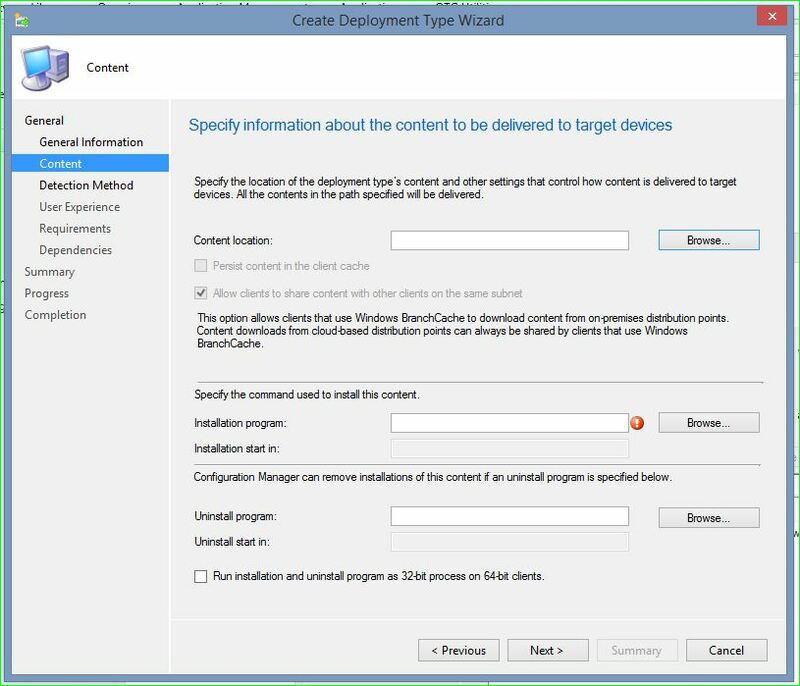 This doesn’t mean that we are installing as soon as it’s available in Software Center; we are simply making the remote application available should we need it. Our primary remote application we use with our many 3rd party service providers is TeamViewer. In this instance we have used GmbH’s Quick Support version of TeamViewer which is ideal in terms of security and minimal surface attack space. We want to install the application on the server, but simply run the executable from the Software Center. 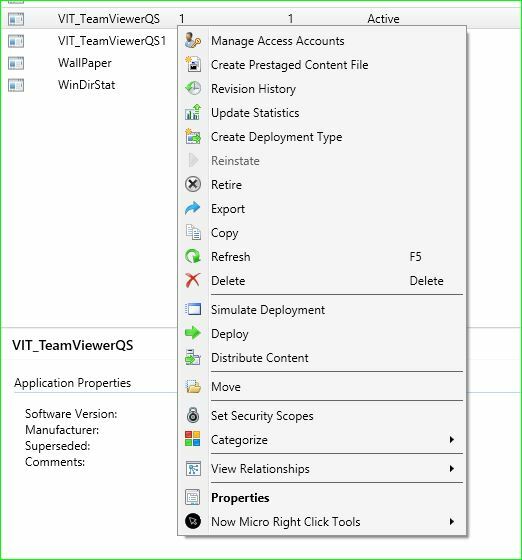 What: Make TeamViewer QS available within Software Center. Why: To have available should a 3rd party service provider require remote access to a server in your environment. Prerequisites; We’ve created a custom TeamViewer Quick Support application using the TeamViewer website creation portal. Browse here to create your own customised version of TeamViewer Quick Support. Here’s how we’ve done it! Browse to Software Library and Select Overview > Application Management > Applications. Right click on the clear space in the middle panel and select Create Application. 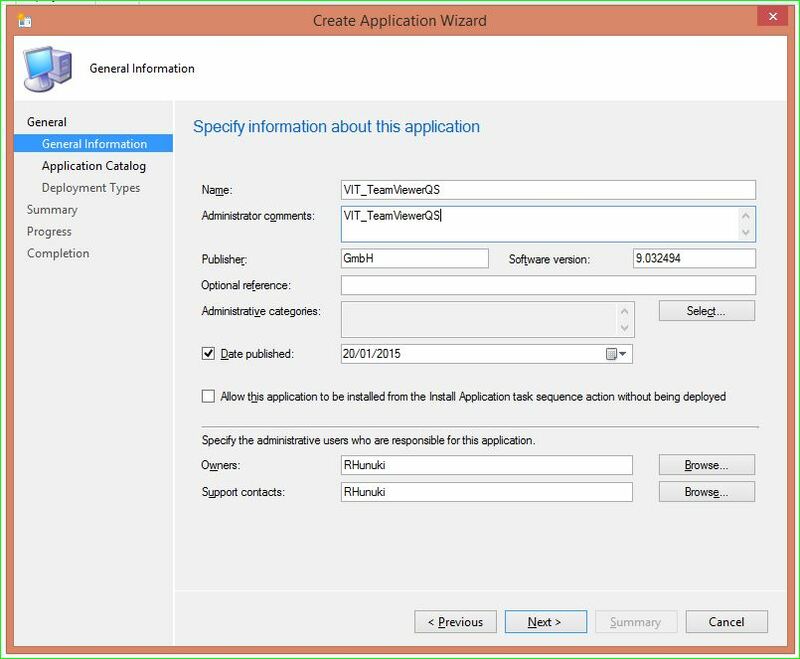 In the Application Catalog, fill in the details as below. The Application Name is standard to our naming convention here, but, should you not have one, simply name the application as you see fit. Under Localized Description, I’ve added a little insight on what we are wanting to achieve. Add in the Keywords respective to the application we’re/you’re building. (Note: In this example, I have pre-installed TeamViewer (unattended support) to be able to select the icon. If you already use TeamViewer, continue on. If not, simply download and install to collect the appropriate icon/image). 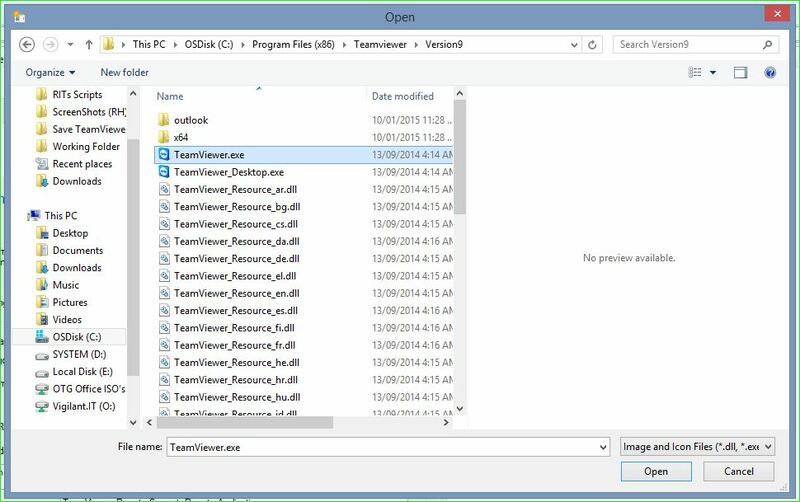 Browse to location of the executable for TeamViewer. Once identified select it and select Open. 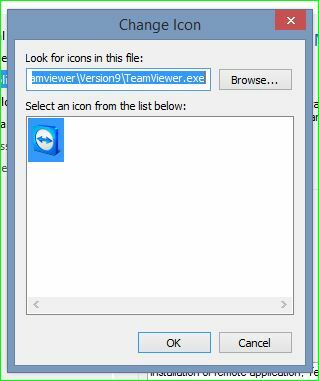 Once selected you should be now, able to select the TeamViewer Icon. Select the icon and select OK. Your Application Catalog should look like below, if you’re deploying TeamViewer. If not, do a quick review and make sure all information is correct. 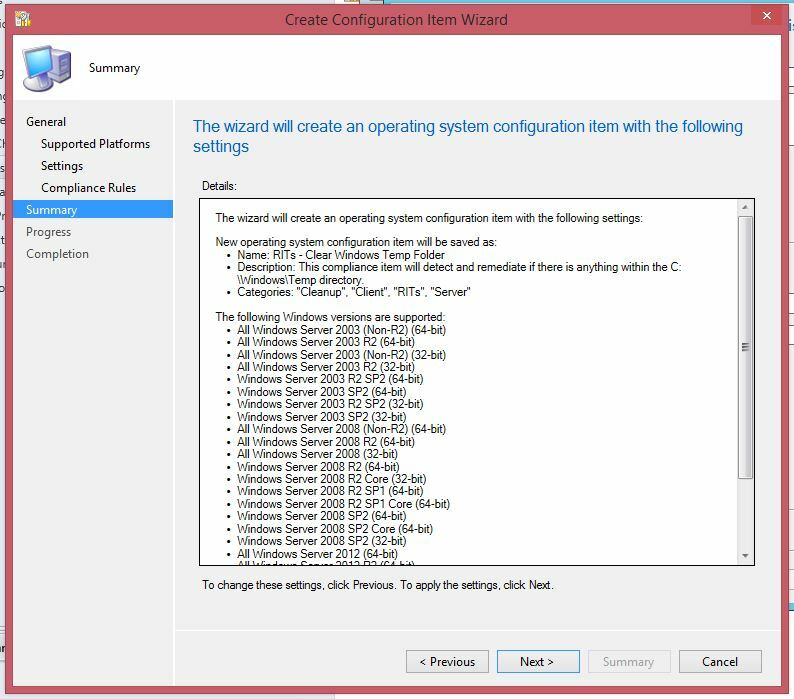 Fill in the information below as you would according to the way you’ve setup your SCCM environment. Content Location: (would be the repository where you would keep your applications, i.e. Primary Site Server, Management or Distribution Point Servers). Now under Specify the command used to install this content, browse to the TeamViewer executable and Select Open. As we’re deploying the Quick Support version of TeamViewer, we’ll need to find the location in which the application is ‘installed’. We’re going to use the Setting Type; as File System. Remember, we’re going to interrogate the location in which the application is installed. With the QS version of TeamViewer, we know that the installation file path is as follows; %AppData%\Local\Temp\TeamViewer. We’re going to look for a folder called ‘Version9’ (or whatever version you’re using at the time). Leave the first radio button selected. Select Ok. Select Operator; Equals and Value; False. Select Ok. Select Next > as we’re not configuring any dependencies. 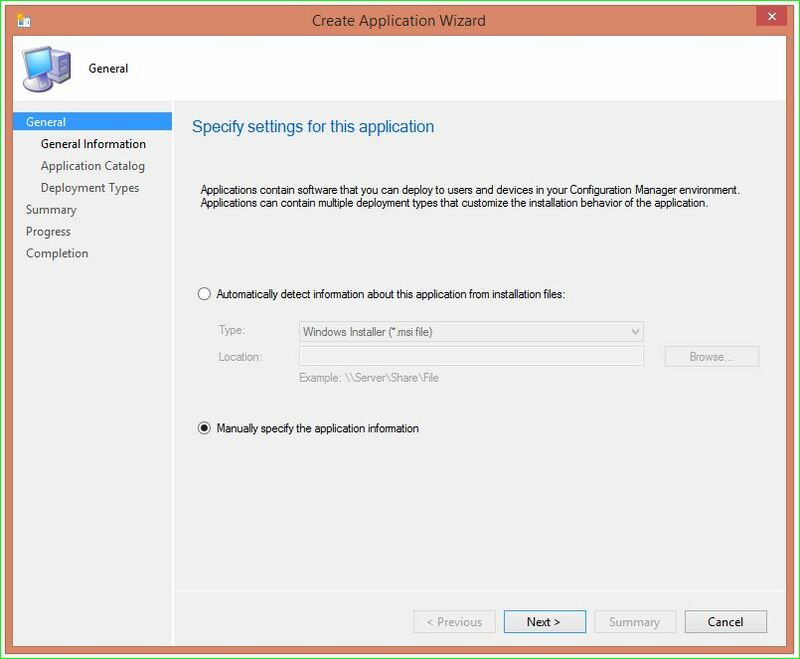 Now that we’ve created the Application within the SCCM Application section, we now need to Distribute the Application to our Distribution Point servers. Right Click on the Application that we’ve just created and select Distribute Content in the dropdown menu. Here I’m going to select the Distribution Point Group. Because I want the Application to be available to all our Distribution Groups, I’ve selected ALL DP Groups within our environment. 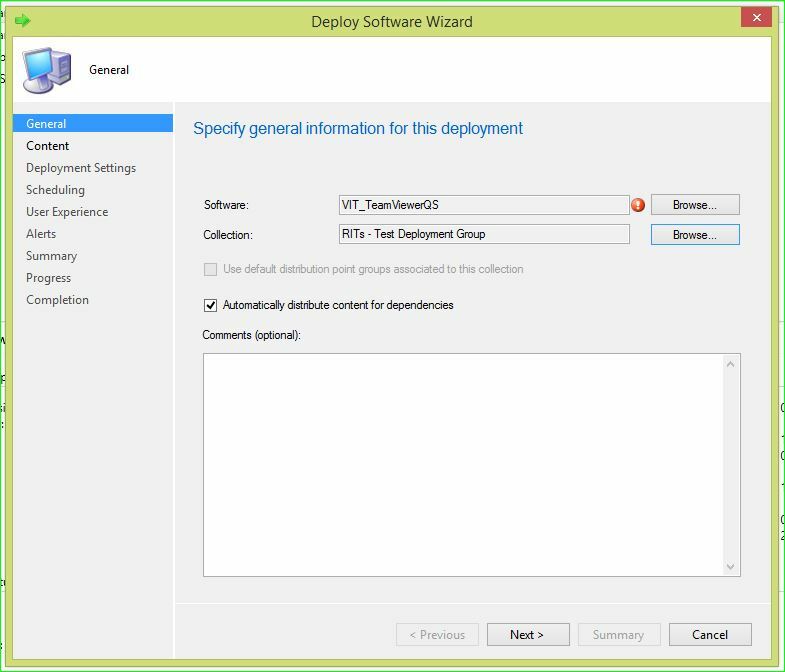 Review the summary of the distribution deployment and select Next > once you’re happy. 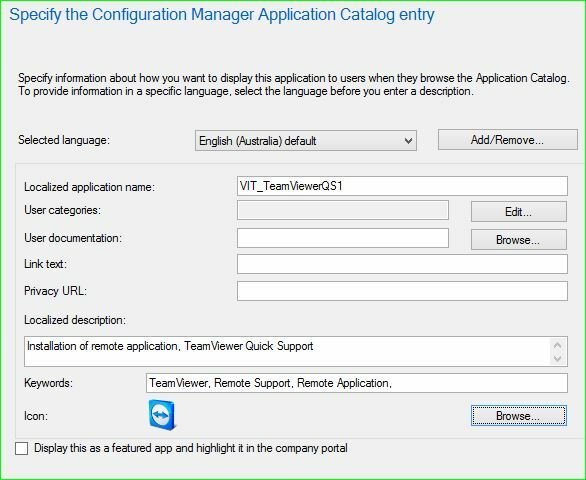 You can review the status of the distribute content process by selecting the TeamViewer QS Application and reviewing the Content Status section (i.e. pie graph). 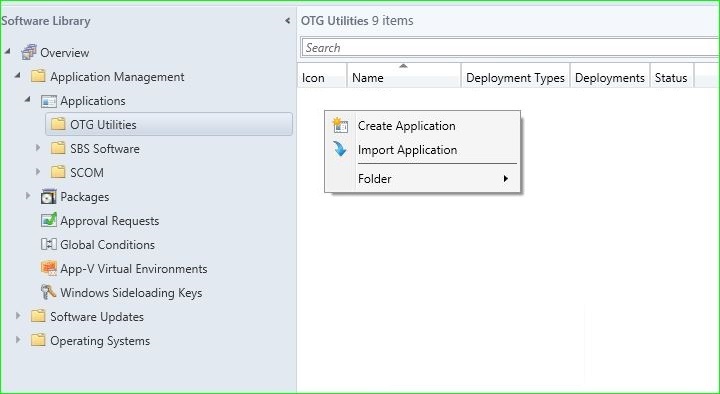 Deploying /Making Available the Application to Collection Groups. We’ve distributed the application to the appropriate Distribution Point servers, we can now start pushing it out /deploying it to our respective collection groups. 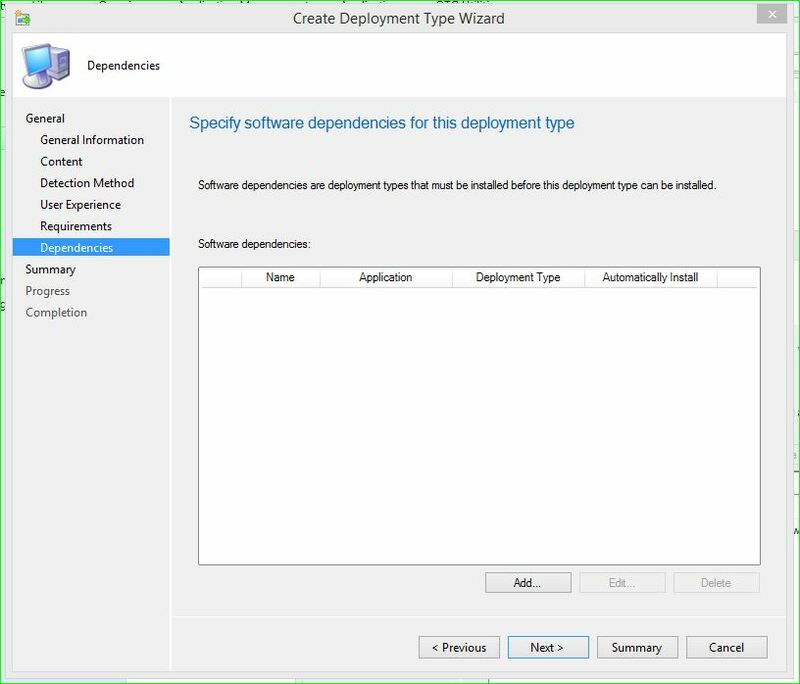 Right click on the Application and select Deploy. Select the Browse… button and select the collection you would like to deploy to. Select your collection group you would like to push out to. Once selected hit the Next > button. In the Distribution Points section, you should see that your DPs and/or Distribution Point Groups are pre-selected. If they’re not, select the appropriate DPs or Distribution Point Groups. Under Deployment Settings, we’ll leave the action and purchase as default (below). Remember, we want this application to be ‘available’, not ‘required’. You should see the deployment to the collection group, successful. We will now look at installing this onto one of the servers that is in the Test Collection Group. One the server in question, browse to ‘Software Center‘. 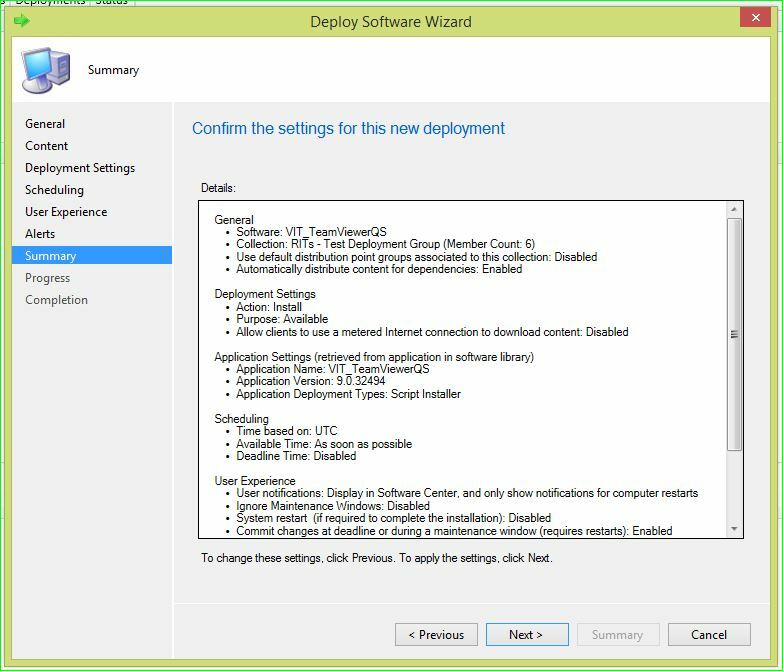 Generally, you should give the server a minute or two prior to seeing the application appear within the Software Center. 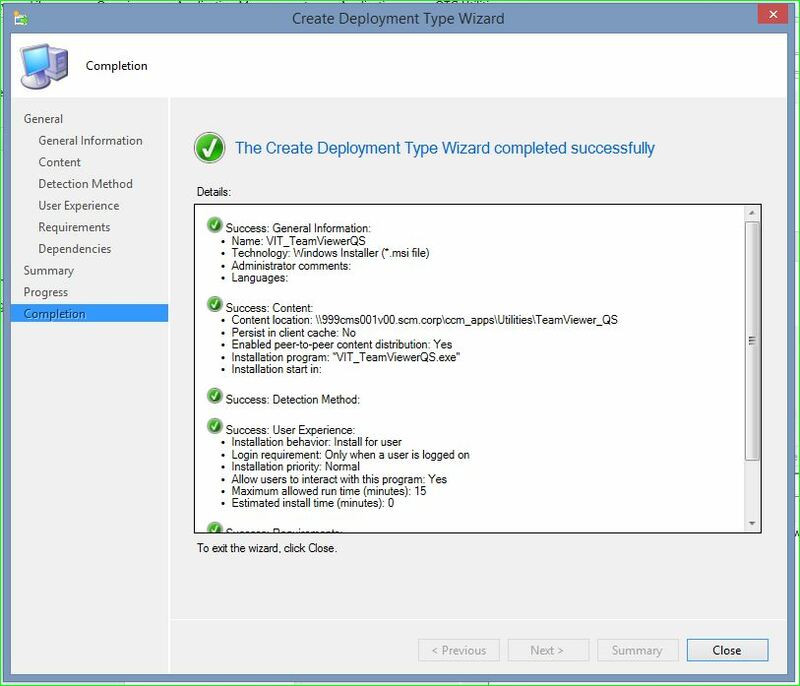 You should see the below image state that the application is available to Install. As you can see, I have initiated the installation. Once installed, you should see your customised remote application, appear and ready for your 3rd party service company to connect. In order to meet the objectives I’ve been assigned which are to perform Routine Infrastructure Tasks (i.e. Maintenance work) against ALL servers we manage, I have taken advantage of SCCM (and as well learning from an SCCM expert) to automate these mundane, lame and boring tasks! The first step with anything is to map out what you want to achieve. Taking the time to plan out your steps from start to finish will allow you to stay focused and keep on track. What you don’t want to do is to lose the momentum you gain when working on a task/project. You also do not want to deviate away from the task at hand as well. Check out Steven Hosking’s blog on Logical Steps to Automate A Task. Why: Stop accumulating unnecessary data on the system drive. 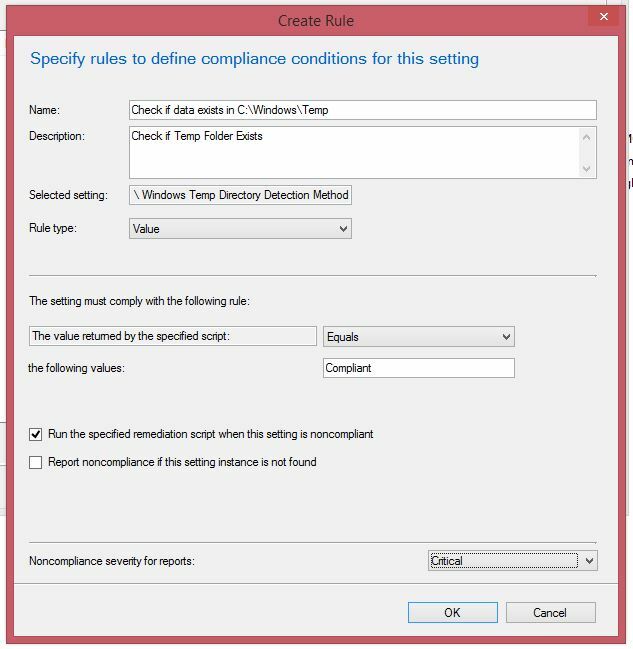 Within SCCM Compliance Settings we will use the ‘detection’ and ‘remediation’ method to achieve our task of cleaning the Windows Temp directory. 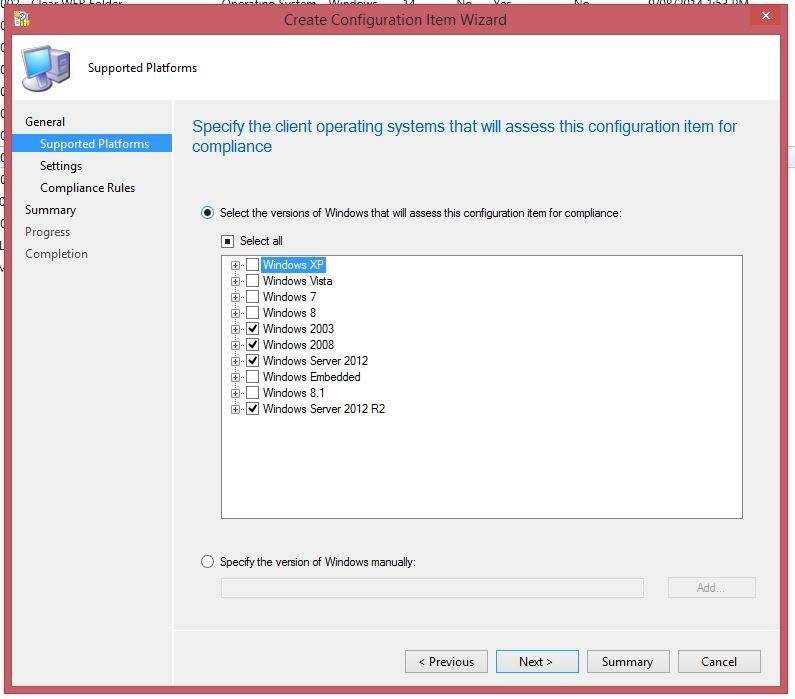 Under Assets and Compliance select Configuration Items. 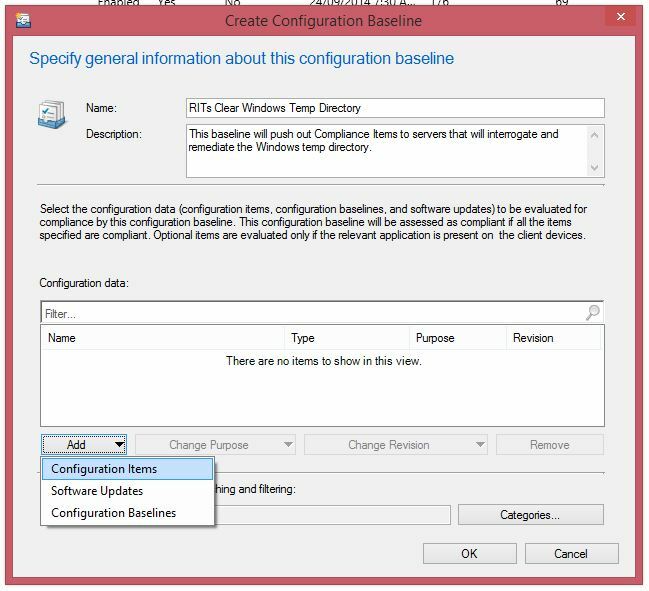 When selected right click in the clear space and select Create Configuration Item. Fill in the below details as you see fit. 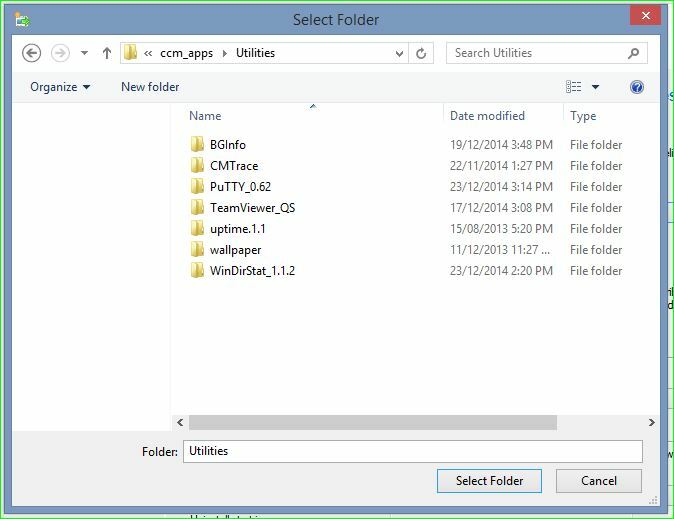 In the example below, I have named it RITs – Clear Windows Temp Folder. As this task is targeted to the Windows devices, we will leave it as is. Use the Categories too, as you see fit. Select Next once completed. As we are targeting servers only, we have selected the below. 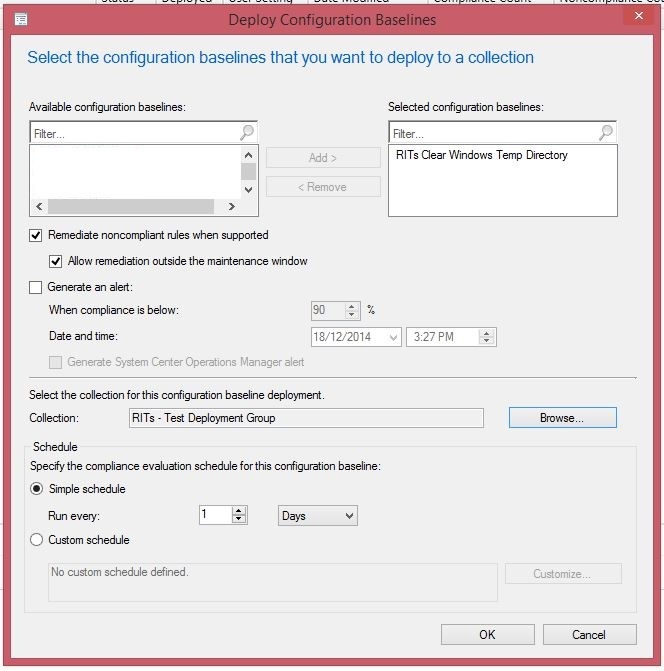 If however you’re managing ALL Windows devices, leave it as default (Select All). Select Next. Enter a Name and Description. From the drop down menus, select Script from the Settings Type and select String from Data Type. Let’s Add Script.. now under Discovery Script. Now with the Discovery Script I have used the following to identify if there are any data within the Temp directory. You ask why have I used VBScript to achieve this detection method. Can I use PowerShell instead? The reason why I have used VBscript over PowerShell in this instance is because of the multitude of servers we manage (also trial and error as I had PowerShell scripts to do ALL my tasks). Because it ranges from Windows Server 2003 to Windows Server 2012 R2, certain PowerShell commandlets may not work with older versions of PowerShell. VB on the other hand is compatible on the majority, if not all Windows servers. Now with the Remediation Script I have left my PowerShell commands from the start. Reason being is that the Powershell commandlet is compatible across ALL PowerShell versions, therefore there was no reason to change. Once completed, you should see the below screenshot match your Settings. When prompted with the Create Rule Window, fill in the Name and Description. Leave the Rule Type as default, Value. Set ‘The value returned by the specified script’ as Equal and ‘the following value:’ to Compliant. 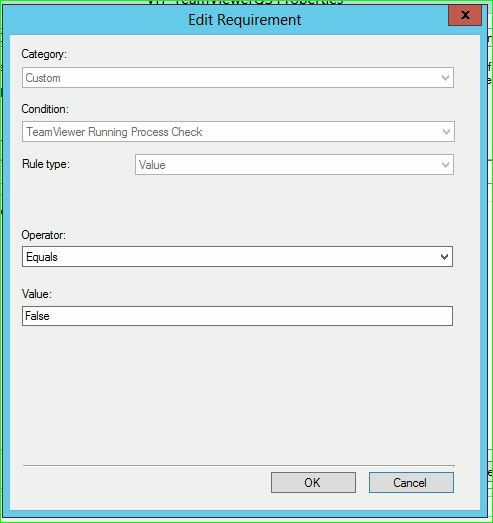 Tick ‘Run the specified remediation script when this setting is noncompliant’. Set ‘Noncompliance severity for reports;’ to Critical. You should now see the newly created Compliance Rule. Hit OK. 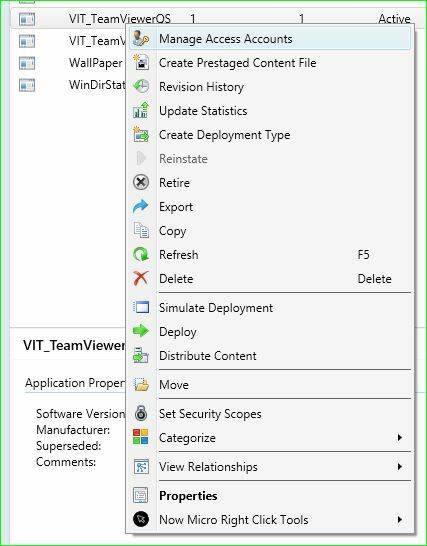 Under the Summary do a quick review before hitting Next > to process and create the Configuration Item. You have now created the Compliance Item. Time to create the Compliance Baseline and deploy it to a Collection(s). Now go back to Assets and Compliance and select Configuration Baselines. From here right click in the clear space and select Create Configuration Baseline. 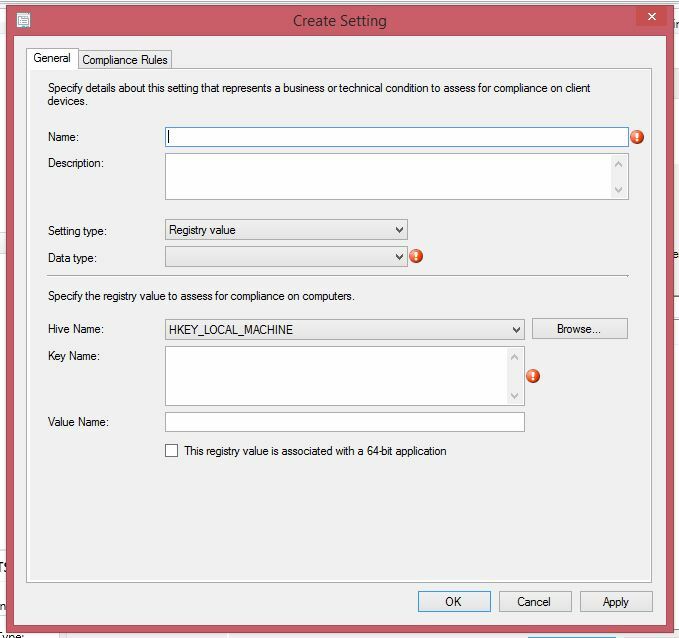 Fill in the Compliance Baseline Name and Description details as you see fit. 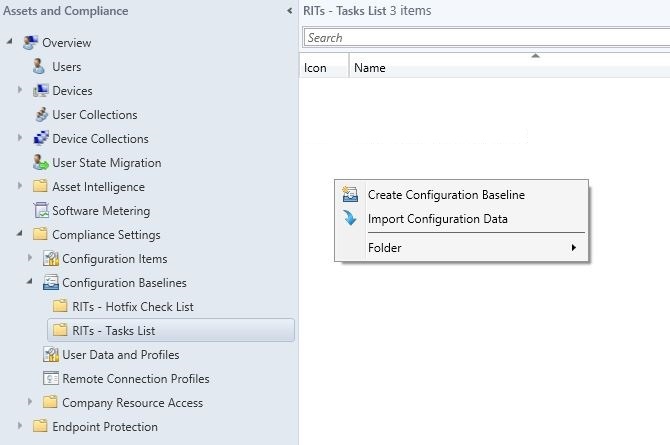 In the Configuration Data field, select Add and then Configuration Item. 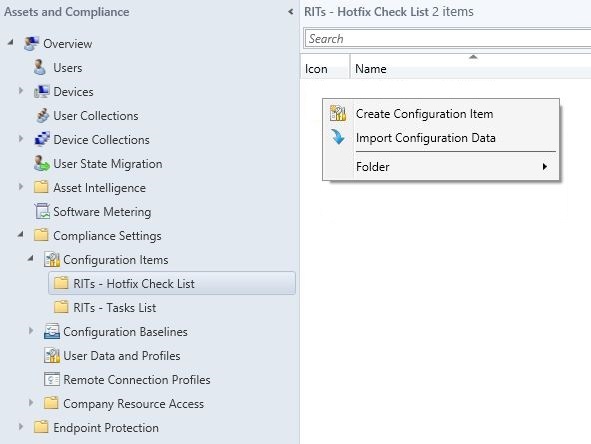 Search for the the created Compliance Item and select OK.
You should now see the Configuration Item now displaying in the Configuration Baseline data section. With any other tasks specific to clean-up/maintenance, I would include them as well into this Baseline. 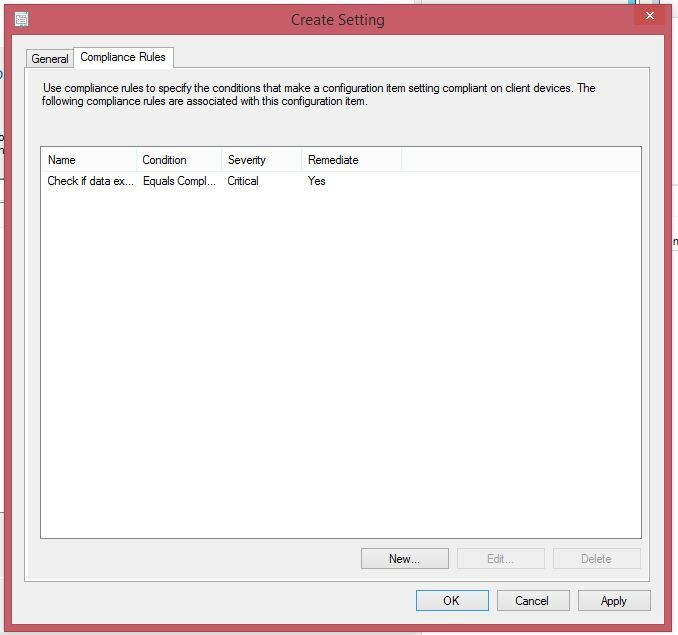 Once completed, select OK.
You should now see your recently created Compliance Baseline. Now it is time to deploy. Right click on the Baseline and select Deploy. By default, the Baseline should already be selected. 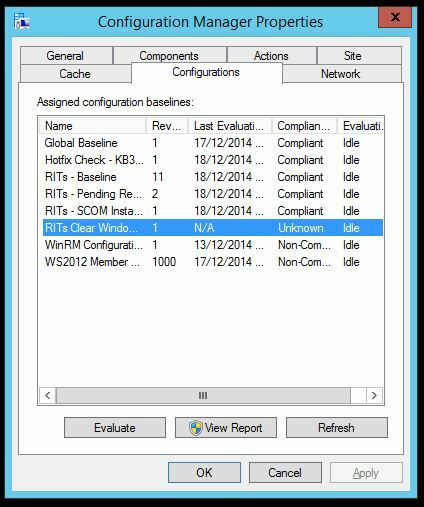 Tick ‘Remediate noncompliant rules when supported’ and ‘Allow remediation outside the maintenance window’. 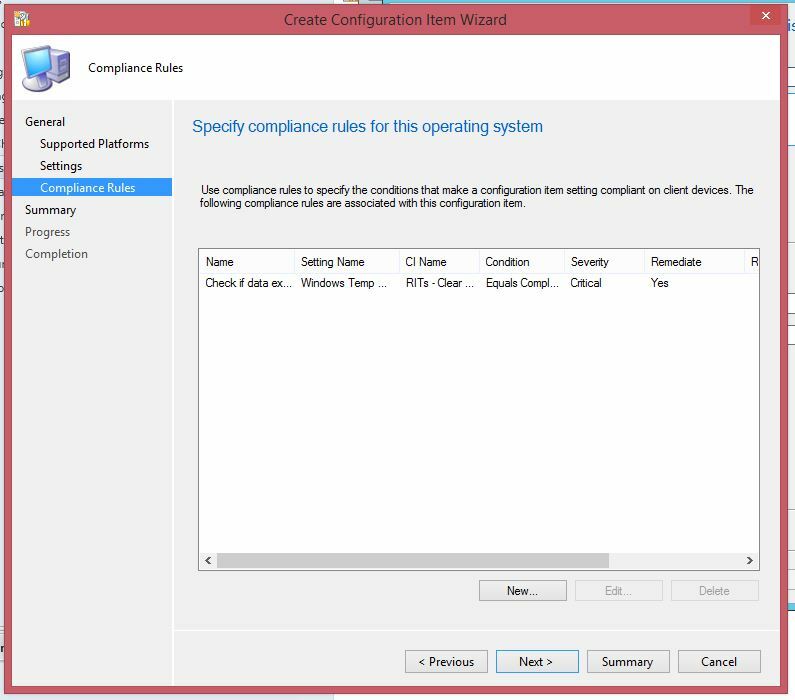 If you are taking advantage of SCOM (System Center Operations Manager) you can generate alerts depending on the compliance rate. We will leave this disabled. In the Collections section, select the Collection you would like to deploy this baseline to. In our case, I will deploying it to our Test Deployment Group. Now set a schedule as to when you would like this performed and hit OK.
You should now see the baseline marked as deployed. Now lets browse to a server associated with that Collection and check to see if it has been deployed successfully. 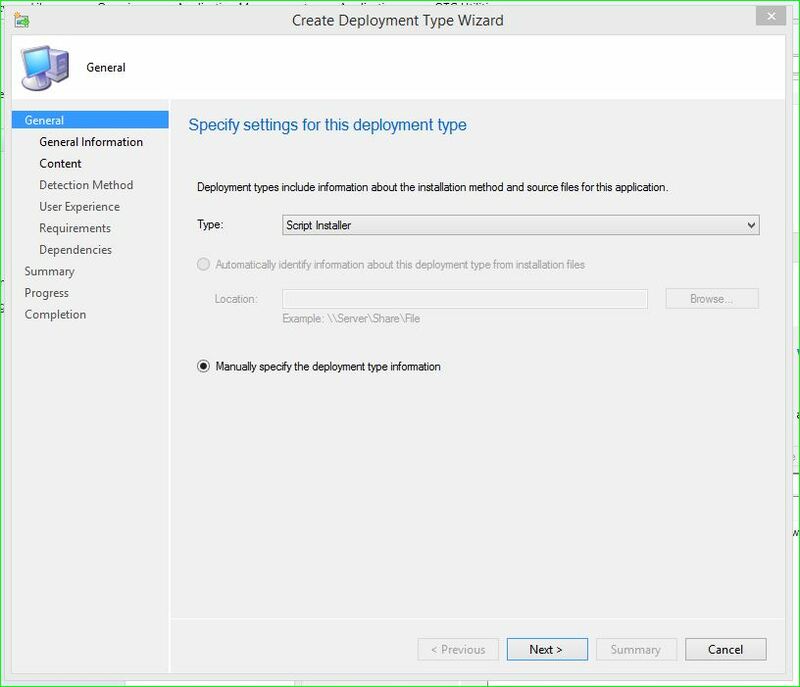 Browse to a server that the Baseline has been deployed to and open the Configuration Manager Properties. Generally it would take several minutes to deploy or pick up (depending on the type of collections available) but you can accelerate the process by going into Actions and selecting Machine Policy & Evaluation Cycle. 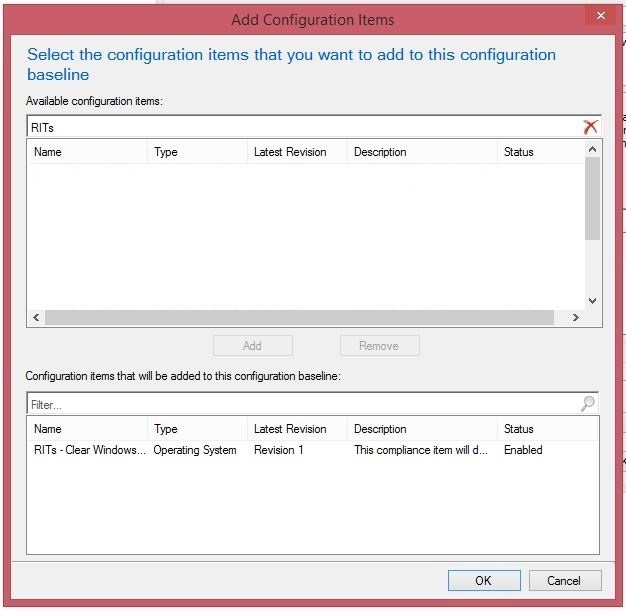 Once it has been selected, wait about a minute, close and reopen the Configuration Manager Properties. 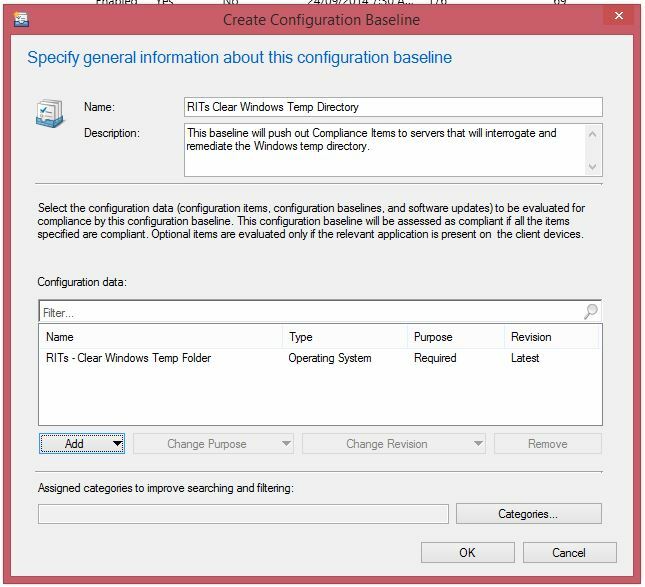 On the server, bring up the Windows Temp directory and lay it side-by-side the Configuration Manager Properties window. Now select Evaluate. After a few seconds, you should see the data disappear within the Widows Temp directory. 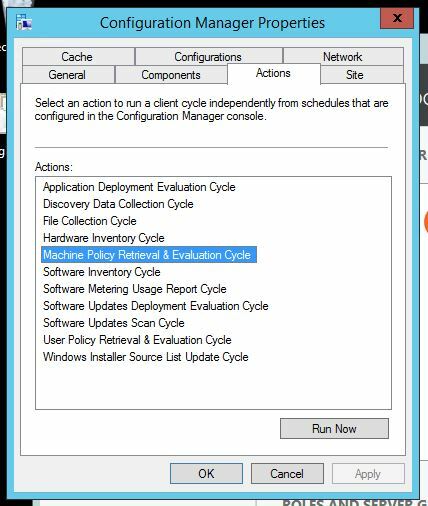 Back in the Configuration Manager Properties window, you should see the following status. 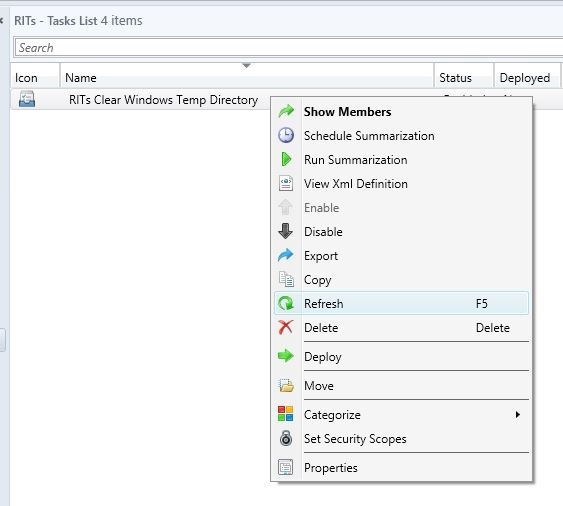 You have no successfully completed/automate the task of clearing Windows Temp directory! 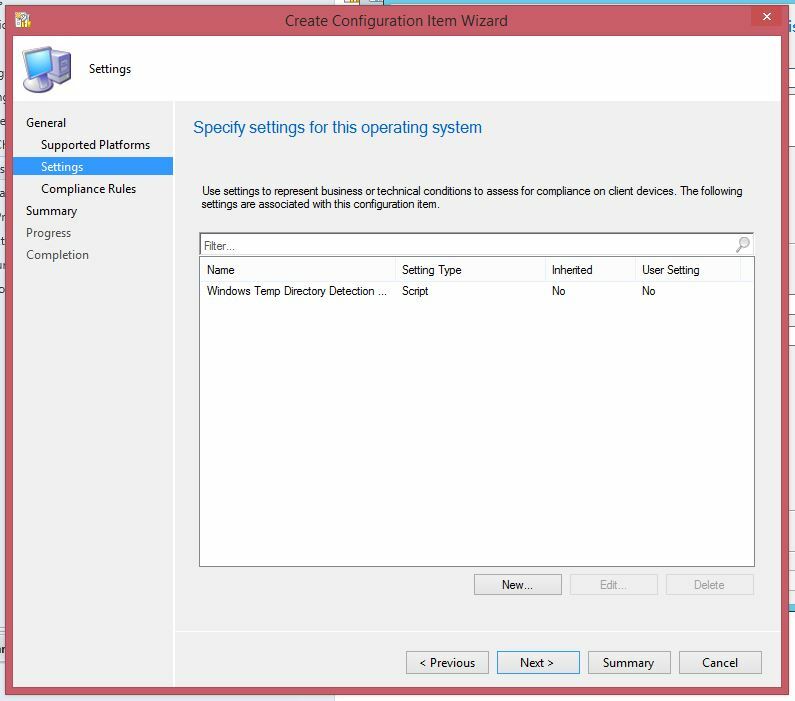 My Introduction to Microsoft’s System Center Suite – Configuration Manager. Over the past year or so, I have been working with Microsoft’s System Center Configuration Manager. The role I have with our company (along with support, project work and other IT related tasks) is to perform Routine Infrastructure Tasks on a weekly basis. Prior to using and leveraging off Configuration Manager, I would have to go through each server (client & internal) and perform mundane, boring, manual tasks. Tasks such as clearing the temp directories, clearing the downloads directory under the Software Distribution folder, performing a backup of the System Info on each server. This is feasible if you’re working with a handful of servers; I was looking at close to 60-70 servers which would take up my entire day. 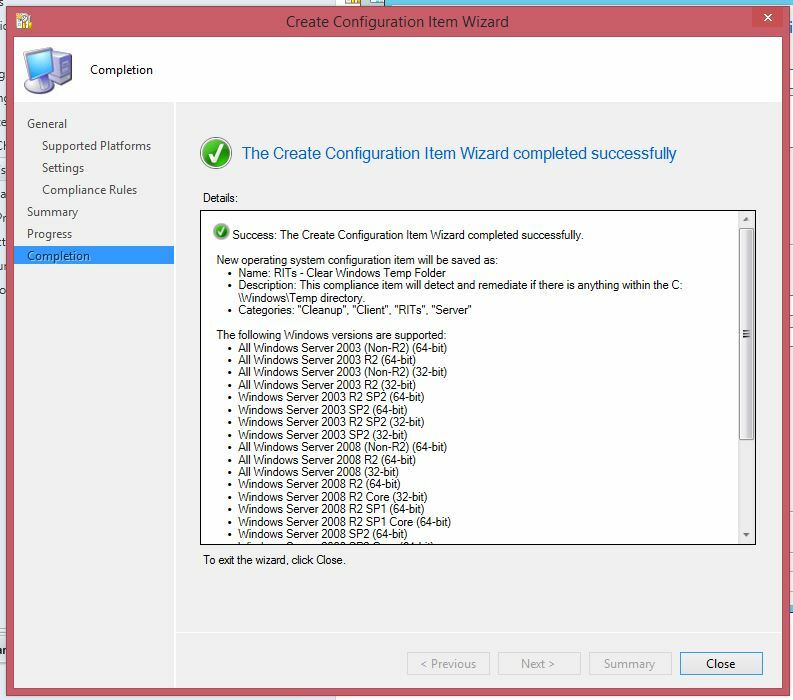 This all changed when introduced to Microsoft’s System Center, Configuration Manager. The following posts will be on how I have used Configuration Manager to my advantage to allow me to automate, monitor and report on the mundane, boring and manual tasks. 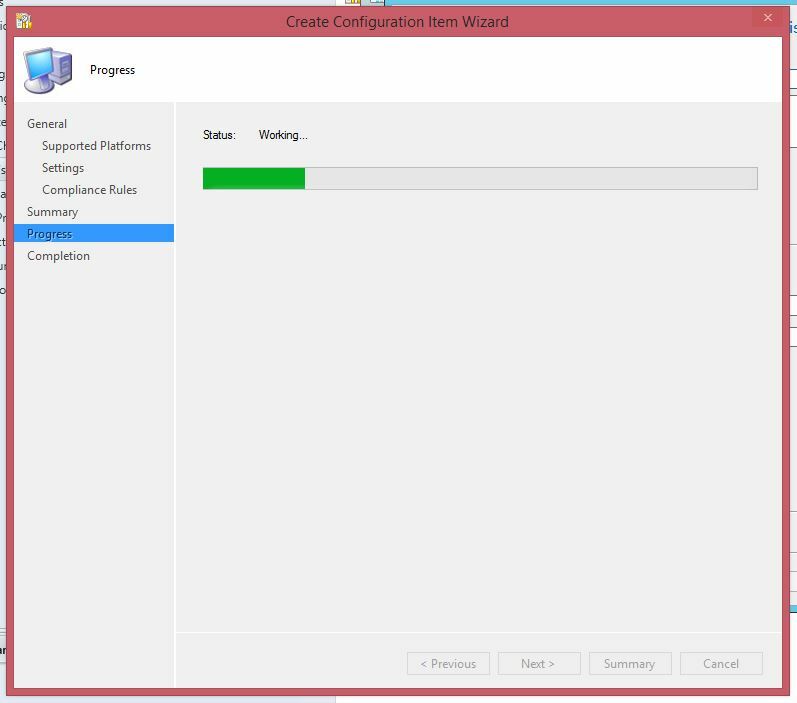 I will also describe how we’ve used Configuration Manager to patch and update our internal/client servers.